Is it stationery or stationary? 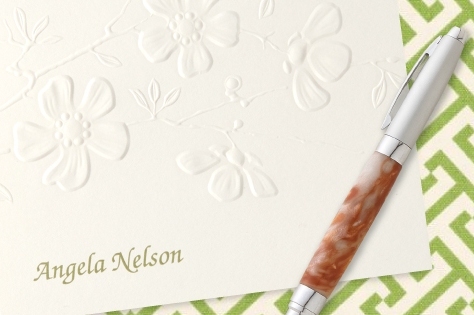 Stationary vs. Stationery — which one is it? As the saying goes, you say to-may-to, I say to-mah-to. A single word may have different pronunciations, depending on regional dialects or traditions. There’s another category of words, such as stationery and stationary, which sound identical, but have vastly different meanings. They are what grammarians call homophones: new and knew; sweet and suite; sole and soul. Needless to say, many people confuse the two words when writing. Here’s one way to remember: the stationery we use to write a letter has an “e,” for the envelope in which we send it off. When we write on stationery with an “e,” it’s usually done from a stationary position with an “a.” Walking and talking usually works (unless you’re on a cell phone, crossing a busy street), but walking and writing? Not so much. Find a comfortable chair and writing surface… maybe a desk or table by a sunny window, or in your garden, seated under a shady tree, and allow the thoughts to flow. Our hands are decidedly not stationary with an “a” when we write on stationery with an “e.” Grasping a pen to achieve legible penmanship takes finger dexterity and a certain amount of wrist action. Use a pen with ink that flows easily but doesn’t smudge. Perhaps employ your free hand to sip your favorite iced latte or lemonade. And, of course, by all means, employ your wit and creativity to express your heartfelt and innermost thoughts. After you’ve finished writing on your stationery with an “e,” and you’ve stamped and addressed it, you’ll want it to not remain stationary with an “a” on your desk. Like an emissary or envoy, the post office will transport your missive to your recipient, whether it’s across town or around the globe. Finally, explore collections of stationery cards, notes and letter sheets at Giftsin24.com. You’ll find a range of styles and sizes for every use. So there you have it. The difference between stationery and stationary comes down to the “e”…whether it’s envelope, environment, energy, envoy or explore, that little letter infuses meaning into one of our favorite words.